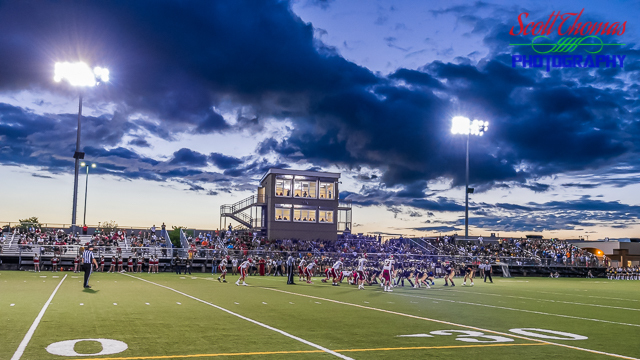 West Genesee Wildcats played the Baldwinsville Bees in a Section III Class AA Football game under the lights at Mike Messere Field in Camillus, New York on Friday, September 14, 2018. West Genesee won 35-0. Nikon D750/16-35VR, 1/125s, f/8, ISO 5000, EV +0.7, 35mm Focal Length. After a few weeks off, I returned to photographing a local sporting event as I attended the New York State Section III, Class AA Football game between the visiting Baldwinsville Bees and West Genesee Wildcats at Mike Messere Field in Camillus, New York. The evening was hot, humid but dry. After sunset, the clouds created a nice backdrop to the drama playing out between the two teams on the lighted field below. West Genesee Wildcats Marching Band performing under the lights at Halftime of a Section III Class AA Football game at Mike Messere Field in Camillus, New York on Friday, September 14, 2018. Nikon D750/16-35VR, 1/125s, f/8, ISO 1400, EV +0.3, 16mm Focal Length. At halftime, the West Genesee Wildcats Marching Band which, has competed and won state and national competitions, performed for the parents, students and fans of both teams. 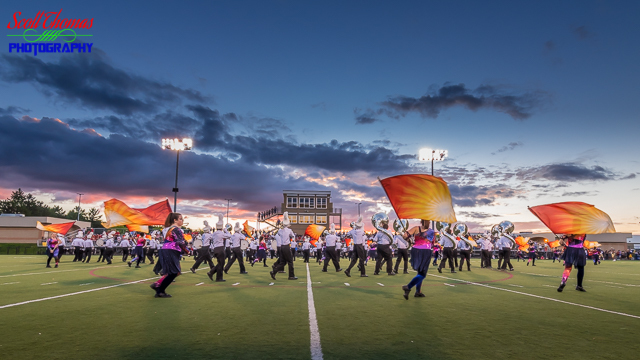 This entry was posted in Sports, Weekly View and tagged 16-35mm, baldwinsville, bees, camillus, class aa, football, high school, lights, marching band, mike messere field, new york, nikon D750, players, section iii, stadium, sunset, team, vr, west genesee, wildcats. Bookmark the permalink.